The use of plants as dyes is nothing new; for millennia it was the only option. Yet in our global era of standardized mass production, the decision to use locally gathered plants as dyes takes on new meaning. This workshop will foreground the meanings of locally gathered plants as dyes with a focus on how our creative output can play between what we make and how we make it. The process of natural dyeing is a relatively simple one. Once we cover the basics we will examine and reflect upon the artistic potential in the process of natural dyeing through plant collecting, dyeing experiments, research, creative record keeping, and collective engagement. These activities will guide participants to a new understanding of their own personal interest in natural dyes as a material, process, and source of ideas for their own artistic practice. All levels of experience are welcome. *Items marked with an asterisk are available for purchase in the Shakerag Store. Please bring materials to work with that you would normally use in your studio practice or that you’re interested in exploring further in relation to locally gathered natural dyes. If you’re a weaver, consider bringing a variety of yarns to experiment with. If you’re planning on exploring natural dyes on cloth, please bring a variety of cloth to work with. It is essential that the fiber content of your yarns or cloth be natural – cellulosic or protein based. Silk, because of the protein in the fiber, takes natural dyes the best. Wool is next, followed by cotton, linen, hemp, ramie, and rayon/bamboo, etc. I recommend bringing a small amount of cloth even if you only ever work with yarn/weaving at home as you’ll probably want it when we’re experimenting. I will be bringing a small supply of various yarns and cloth for sale that people can experiment with, but again, because I’d like you to engage with the ideas of local, natural dyes without the entanglements of simultaneously learning new techniques, please bring materials that you are already familiar with or would like to experiment more with. It is my goal to support your personal creative growth in relation to the ideas and creative processes evoked through the use of local natural dyes in this workshop. Because this is the focus of the workshop we will not invest large amounts of our time together in completing specific works. I recommend, however, that you bring any tools/supplies that you foresee yourself using that are not available at Shakerag. Please consider your own practice when deciding what materials and tools to bring. Remember that sometimes great limitations can produce infinite results, so there’s no need to re-create your studio from home at Shakerag. 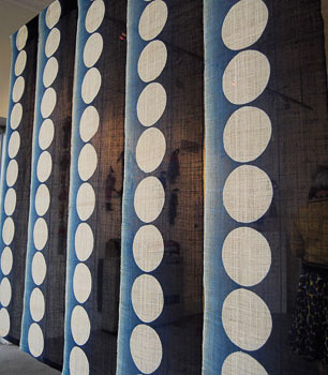 Rowland Ricketts is an indigo farmer and dyer who utilizes natural dyes and historical processes to create contemporary textiles that span art and design. His recent projects work to involve others in the process of local plant dyes to question how we live, create, and consume in contemporary America. Trained in indigo farming and dyeing in Japan, Rowland received his MFA in Fibers from Cranbrook Academy of Art in 2005 and is currently an assistant professor of Textiles at Indiana University in Bloomington. His work has been exhibited at the Textile Museum, Cavin-Morris Gallery in New York, and Douglas Dawson Gallery in Chicago. Contemporary science tells us that color is a sensation experienced because of the differing wave lengths of light waves. To me this is only part of the story. As an artist, my sensation of color is also informed by each color’s material substance and the processes that give color form for me to reflect upon. Materialized from the soil, rain, and air around them, plants physically embody place. Plants also embody their individual histories, as well as the history of their species and its interactions with humans. Using gathered and cultivated plants as dyes I transfer their color to cloth with traditional dyeing techniques honed over centuries. The colors obtained are enriched by each plant’s historical, cultural, and physical substance as well as by the connection across time to all who ever worked within these traditions.